‘Pensioners using Aldi and Lidl’ to blame. 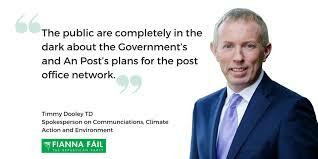 Minister for Communications Denis Naughton has said the closure of rural post offices is set to continue. Nearly 160 offices are earmarked for the chop as his government yet again denudes the countryside of the means to survive. 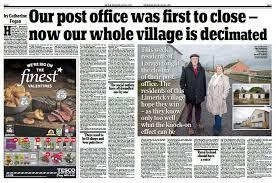 However, Fianna Fail, themselves no stranger to rural closures, have said the government is using the retirement of postmasters and postmistresses “as a smokescreen and cover” to shut the post offices in the 159 rural communities. In a statement published on the Fianna Fail website, party spokesman Timmy Dooley also highlighted the effect that the shut down is set to have on the countryside and the motion to protect and preserve rural post office network his party proposes to table. “These closures as well as harming local businesses will have a disproportionate impact on elderly and vulnerable citizens who rely heavily on their local post office. “We are hearing reports that many elderly people will have to travel upwards of 25km, to and from, their next nearest post office, to collect their pension or pay their bills. “Pensioners are not natural online users and while many are making the switch to digital, a high number are completely unable to do their business online, and therefore the removal of their local post office will be an intolerable burden on them and also their families. “It must be remembered that these 159 communities are by their very nature located in some of the most isolated parts of the country with little to no regular public transport options available. How can we ask pensioners to spend €15 to €20 on taxis just to collect their weekly pension of €230 per week? “Our motion is clear that the Government must initiate a Public Service Obligation (PSO) payment to ensure that these post offices remain open. The contracts to run these post offices must also be advertised to allow other interested parties get involved in delivering these vital public services.